There's a new online flooring publication called TalkFloor.com. Have you heard about it? Have you subscribed for free daily email updates? TalkFloor is the creation of John Simonson from Webstream Dynamics [also author of Flooring Insights & Tips blog] and Dave Foster, of FloorRadio. TalkFloor is the vision of two flooring guys. One guy with a microphone (that's Dave Foster of FloorRadio) and one with a mouse (that's John Simonson of Webstream Dynamics). 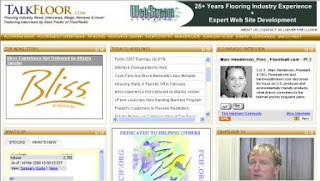 We felt there is a real need for a great flooring industry web portal to keep flooring professionals up to date on the latest happenings in the flooring industry. A web site that is totally committed to bringing the latest news and audio interviews, as well as product videos, expert blogs, resource guide, marketplace, industry events, job opportunities and lots more exciting things. If it is happening anywhere in the flooring industry you will find it here first!!" Key words: web portal and expert blogs. That what makes TalkFloor particularly unusual. The first flooring industry portal to feature blogs! Here's the visual lineup [I know the images are small - Can you pick me out?] And, more detail on the TalkFloor blogs, which cover a wide range of topics. + The Brand Stand by Paul Friederichsen from BrandBiz Marketing Communications discusses marketing and branding. + Web Strategies by John Simonson is all about Web Site Design, SEO & Web Marketing. + Design by Don Marlowe offers design perspective. + Sustainability by Jon Dougal, who has a rich background in sustainable design [he's also the editor of the Green InSight Newsletter], promotes sustainability. + Flooring the Consumer. Although it carries the same name as this Flooring The Consumer, it focuses more intensely on the flooring consumer. At least, so far. + Round the World by Jim Gould from the Floor Covering Institute offers insights into the floor covering business from around the World - literally! He's just come back from China. + Zeitgeist by Ben Kinlaw offers insights into housing, flooring, and the economy. Surfaces 2008 - Focus on the Consumer? Do check out TalkFloor.com and consider subscribing to the email newsletter [on front page, right hand side]. It will definitely keep you in the flooring know! The Age of Conversation: What's Next? This weekend was truly momentous. More specifically, Saturday March 29th. You see, that's when Social Media Bum Rush Happened for The Age of Conversation, the amazing book created from the contributions of over 100 bloggers from around the world [including me]. In between my daughter's Saturday dance class and other weekend obligations, I witnessed and participated in some of the excitement. Before my eyes, I saw the ranking of The Age of Conversation change on Amazon. I contributed a few tweets [coded #AOC for tracking], added an Amazon review [although it hasn't yet appeared], and purchased. We made one last push up the charts that came in just under the wire! What an amazing day! I along with the 103 authors of The Age of Conversation thank everyone that bought a copy (or more) of the book and helped generate buzz. Our combined efforts created a wave of conversation, blowing up on blogs, Twitter and other social media outlets, ultimately propelling the book from being ranked at 102,282 all the way to #36 on the Business Bestsellers list and #262 overall. Thanks for joining the rush!" Thank you for being a part of this momentous day! Equally exciting is getting a taste for what's next. In January 2008, I asked What's the 2008 Version of Age of Conversation? Today, I share with you the details as announced by Drew McLellan in Meet the Age of Conversation '08 authors! First, the theme: "Why don't they get it?" Second, each contributing author will select one of eight topics that falls under the "why don't people get it?" theme to address. That makes it more interesting! Finally, here are the 274 authors of the 2008 Age of Conversation: Why Don't People Get It? I am extremely honored and excited about taking part in this next version of The Age of Conversation: Why Don't People Get It? I promise to share more. Have you been keeping up with the Women of Wear-Dated? 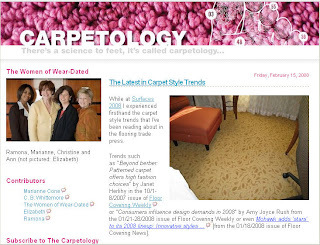 If not, here's a quick summary of what we've been up to in the past month over at The Carpetology Blog. Pray Tell: What is a Frieze Carpet? Please let us know if you come across any intriguing ideas to showcase, or whether there are specific subjects that come up when you discuss carpet with customers, friends and family. Enjoy, and Thank You for reading and subscribing! Which Is Better? Buying Cars or Carpet? We Buy Cars originally uploaded by AntyDiluvian. I recently came across this Letter to the Editor of The Connection Newspapers from Alex Cullison of Fairfax, Virginia. It is titled: "Buying Carpet or Cars?" I consider this serious stuff. So serious, that I'm referring to most of it here. It's the kind of thing that gets my attention. Because it gets to the heart of issues that plague the carpet business. Not that these issues are unique to carpet or flooring, but they are all too prevalent. And, I predict that they will become even more objectionable as the consumer gains more power, can more easily express frustration and becomes better able to come up with solutions to the frustrations. In fact, I've also discovered Cullison's comments on Helium.com. At the heart of these issues lie transparency and authenticity - telling the truth and not obfuscating - so that consumers feel enthusiastically delighted about their purchases [think of the delight that an Apple iPod purchase generates] rather than that they've been taken for a ride. It gets my attention because I frequently compare the carpet buying retail experience to that of purchasing used cars. But it's another thing for a real-live consumer to use that analogy, and rate car buying ahead. Considerably ahead. I am in the market for new wall-to-wall carpet for my home. This sounds simple enough. You decide on a color and style and make a purchase based on your budget. Nothing could be further from the truth. I am the type of person who reads Consumer Reports and other similar review publications and buys accordingly. I won't pay more for something because of a designer label or snob appeal. I will spend more for something; let's say a car tire, if the performance and wear justifies the expense. In our family, we strive to make thoughtful informed decisions, especially regarding large-dollar purchases. Unfortunately, unlike just about any other purchase one can make in this civilized world, the carpet industry has effectively established a marketing culture making it almost impossible to determine general values of quality and pricing. This culture of imposed confusion is embraced by all the companies that make carpet. This is exacerbated by the fact that fiber selections are not directly related to actual rug construction. You can choose a great fiber and good luck finding out what company actually made the carpet out of that fabric. Further, each carpet manufacturer has its own cute criteria/system for determining wear ability, stain resistance, static protection, etc. Lastly, the industry refuses to use the same terms from one manufacturer to another. One company uses a term "Softbac" for a flexible carpet backing, while others call it “Action Back” or “OPTIBACK.” Density, weight and other determining factors should be quantifiable absolutes but become abstract and nebulous in the way the industry presents this information. Buying carpet is not fun. 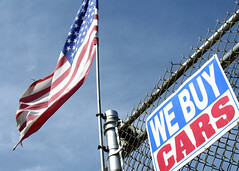 It is easier to buy a used car in terms of decision-making. My family is willing to pay more for a product if it can demonstrate cost effectiveness albeit there is no way of effectively researching carpets in order to make an informed decision. I have spent more time than I care to admit trying to find reliable data and some common denominators in the carpet industry. The carpet moguls have won. I am at the mercy of my carpet salesperson and the industry marketing hype. Ironically - going back to the Apple example - anyone walking into an Apple Store knows that anything within costs more than the equivalent MP3, laptop, phone... And, yet, everyone walks in willingly. Each one knows exactly what s/he is considering - having been able - assuming a desire - to compare it to equivalent products. And, yet, consumers still walk in and purchase willingly and with delight, impatient to get it home and start playing. So, carpet industry. What are we waiting for? Let's make carpet buying as exciting and inspiring as buying something from Apple - and a LOT better than buying a car! Social Media Bum Rush Happens 3/29/2008. Please Participate! NOTE: As incentive, I have created and posted a document summarizing and organizing the 103 chapters from The Age of Conversation [based on the 'slices' I published last summer in the posts listed in The Age Of Conversation RoundUp] -- to whet your appetite! The last time a social media event of this sort happened - and let me tell you this is a recent but powerful phenomenon - is when Joe Jaffe so successfully bum rushed Amazon in October 2007 that his book Join The Conversation wound up 2nd only to Greenspan's! In one day, if I'm not mistaken. Impressive. We'd like to do the same for The Age of Conversation. It's a long anticipated event as announced in Extra, Extra: The Age of Conversation on Amazon, and the date has finally been set. Better late than never and now let's get on with the bum rush! Per Drew McLellan's instructions, here's the plan to bring this ground-breaking work to a wider audience via Amazon, Barnes and Noble and other quality retail book selling sites. Remember, not only do you get a copy of a great book, but the children of Variety's LifeLine literally get the gift of life. 1. On Saturday, March 29th, we need you to purchase The Age of Conversation from Amazon.com to support the Social Media Bum Rush [as outlined by Chris Wilson]! 2. If you want to purchase several copies, please do so in separate transactions. 3. When you purchase, please go to Amazon via this Amazon affiliate link to The Age of Conversation. 4. 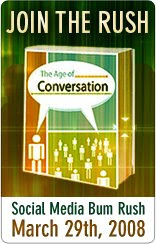 Please encourage others around you to purchase the book through this Amazon affiliate link to The Age of Conversation. 1. Please post the badge to your blog. 2. Talk this event up and help generate as many touch points around the web as possible so that it will be hard not to spot the Age of Conversation activity. 3. Buy the Book & send others to buy the book. For Twitter Commentary - Join Gavin, Chris and Drew as they provide Bum Rush play-by-play on Twitter. (Follow them: @Freshpeel, @DrewMcLellan, @servantofchaos.) If you add commentary about the Bum Rush to use the code #AOC so that it can be picked up by Twemes.com. 2. Digg the posts listed on Chris' site and send emails and shouts to friends requesting Diggs. 3. Stumble the posts listed & tell friends to do the same. 6. Send an Old Fashioned email to your friends about the Bum Rush for AoC. 7. Keep talking - Get on ooVoo, iChat, Aim, or where ever you like to talk, and start talking. To add the Join the Rush Badge to your Blog or Web page: simply copy and paste the HTML code from Drew's blogpost. + Add your Reviews and tags on Amazon - Help fill it up! + Join the Facebook Group - You can join the group here. + Become an AOC Fan on Facebook - Join the AOC fan page here. Please help make this day a huge success. Don't forget! Join The Rush on 3/29/08. Thank you! Sam Allman, author of Heart & Mind Selling, and often referred to as The Dean of Mohawk University, presented "How To Survive and Thrive During a Slowing Economy" during Surfaces 2008. Running a business is not the same as doing the business [think how different it is to do a job vs. running a department of people doing your job. It takes getting used to]. Retailing represents an interesting business model in that, once the doors are open for the day, the assumption is that "they will come" and that it is up to them [i.e., the customers] to come back, to followup, to complete the sale. It's a flawed assumption. Not only because of the slowing economy, but also because the consumer is shopping differently. Forget sitting back and waiting passively for it to get better. That option leads to shutting down the business. Better to become more creative and create results. According to Sam, the average salesperson never reads a book on selling. The best salespeople are 'students of the game.' They've observed and internalized how best to romance the customer. All salespeople need to master the basics of selling. 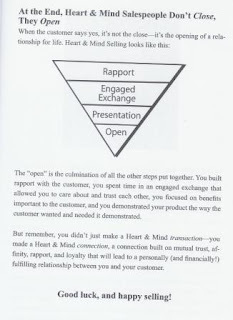 In Allman's model of selling, the funnel starts with creating rapport, then engaging inquiry [or engaged exchange] during which you qualify the customer via a two-way excited conversation; it's equivalent to a state of the customer [formerly known as the "probe" - not the nicest way to describe learning more about a customer!]. Next, presentation of products or solutions, which - if done well - will open [not close] a lifelong relationship. That lifelong relationship means that next time that customer comes to you, price will not be an issue. Subsequent sales are easier because the customer trusts you. You've developed rapport and mutual trust and affinity. How to do so? Find areas of commonness, listen, be interesting, be interested in the other, smile/look professional [did you know that closing rates are higher for well-dressed professionals? ]; be safe, never say "may I help you?" The engaging inquiry or engaged exchange is about understanding the customer's decision making process. It requires mastering the art of asking questions [Ask at least 17 questions before showing any product to better understand fashion preferences, performance requirements, budget decisions, etc.]. Make sure to never talk longer than thirty seconds without asking a question. Never say a thing that you can't find a way to ask. The reason is that rather than tell, you want to sell. By asking questions, you involve your customer in the decision-making process. During the presentation, be sure to convey conviction, enthusiasm, and passion for the customer [all buying decisions are emotional, including the decision to purchase from you and your store]. Remember that you are selling benefits, not features [people buy for their reasons, to benefit their lives], and that you are presenting the benefits from the customer's perspective. The open. It's the point of everything we do. Right? Were you aware that 76% of sales presentations end without asking for the order? What a missed opportunity. This is the time to handle objections, to be persistent, yet - at the same time - so customer focused that you aren't perceived as pushy. Peak performers must first have empathy so they can connect and communicate with customers. Next, they must have "ego - drive." This motivates them to make the sale, be pro-active and take action. It also means that they are busy increasing the likelihood of making a sale even during off-peak periods and in between customers. During slower times, fewer customers come into stores. So, focus on improving close rates. Do more followup. Did you know the industry averages a closing rate of 26.8%? Send a thank you note within 24 hours whether they buy or not. Add something personal, send a gift [remember love leads to reciprocity]; make contact w/in 72 hours of the first visit. Allman suggests tracking every customer entering the store until they buy or go elsewhere. The point is to monitor the information to learn from it - and then figure out how to improve the closing ratios! Keep score, too, with salespeople. Measure performance so they can improve. A salesperson with goals is 33% more productive than one without. Food for thought! Also try to increase your average ticket. Consider selling at higher prices than your competition. Yes, you will need to explain why you are better or different [i.e., "it's not the same" because you have certified installers and guaranteed installation]; just make sure those differences are real. Stay away from being price driven. If you use price, you are nothing but an order taker. Did you know that for every 69 cent increase to a McDonald's ticket, 62 cents goes to the bottom line? The message is: upgrade, add-on. Start high [e.g., you might say "this is something a little more than what you wanted to spend. Do you want to see it...?"] , then work down. Sam says to lead with 4 or 5 products. No more or you will confuse the customer. This also makes the comparison process easier. Create curiosity! Sell anticipation or the feeling of ownership. Present emotional benefits. Take the focus OFF of price. Reduce it to the ridiculous [e.g., it's only 39 cents a month vs. $10k] so it disappears as an issue. Offer credit [did you know that 80% of home furnishings are sold on credit, but not carpet?]. Once you have begun the relationship [i.e., the open], ask for referrals -- without saying 'referral'. Instead, you might ask whether your customer has any friends you might help. Be sure to call 18 months later to remind your customer to get the carpet professionally cleaned; that keeps the warranty valid. Stay in contact with your customers. Be everywhere, be visible, be creative to find business. Definitely be involved in the community! Call your customers when they are down. Be there for them. Never sit back and be complacent! + From MarketingProfs comes Five Tips for Marketing in a Recession by Glenn Gow: spend smarter, double-down on your current customers, outsmart your competitors, invest in growing market segments and fight for your resources. + High-end dealers fall back on the basics to stay ahead by Sarah Zimmerman from Jan 28/Feb 4, 2008 supports staying as far away from price as possible, and focusing on offering better service and products. 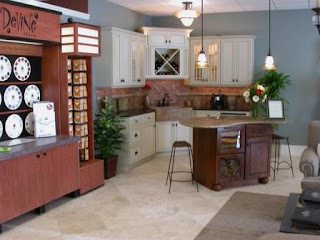 Make sure your showroom is not only clean and neat, but also inspires creativity and feels welcoming. Be sure to deliver an impeccable experience. + Media Recession? Probably Not… by David L. Smith includes a fascinating paragraph with critical advice. It states: "astute marketers know that advertising in a down economy gains market share, which generally is sustained when markets come back. This has been established a number of times in newsletters and research papers from the MPA." The lesson: continue to advertise! Note: Sam graciously sent me a copy of his book - Heart & Mind Selling. It goes into delicious detail about the points made during his presentation, and will definitely make you appreciate selling as you have never before [and don't forget that selling takes place with your children, parents, siblings, significant other as well as for work!]. Thanks, Sam. Columbia Business School's Brite '08 conference included fascinating roundtable discussions. Each one started out with formal comments - i.e., conversational backdrop - and then we were let loose to discuss within our smaller table group. Maryam Banikarim, CMO, Univision, provided the backdrop for a discussion titled "The New Marketing Department – Challenges, Opportunities, and Skill Sets" which David Rogers, Director, Center on Global Brand Leadership facilitated. For anyone remotely interested in connecting with the Hispanic market, Univision is a must. Maryam explained why. Univision has 80% market share [can you imagine that level of visibility and awareness with this increasingly important consumer market?] and has been around over 40 years. Univision considers itself the champion of the Hispanic consumer. Maryam joined in 2002 during troubled economic times when the network first experienced single digit growth [a shock compared to double digit growth]. She observed that selling was more about impersonal bar charts rather than focusing on bringing solutions to customers. A big problem. So, she brought in a more consultative and strategic approach. She hired account planners to talk about consumer insights and connect emotionally and MBAs to analyze. She decided that marketing would run programming and sell emotion, using a new format for its 2007 Upfront Event for selling programming to advertisers titled "I heart Univision." The format included consumer generated media with testimonials and user-generated content. Banikarim conducted an online promotion inviting viewers to send in videoclips of why they loved Univision. She and her team weren't sure what to expect - or even whether they would receive submissions. They were surprised that the first submission came from an older woman who said "A day without Univision is like a day without sunshine." Powerful! Twelve viewers participated in the event - a first. They swooned when Don Francisco came on stage and quickly got into the RBD group groove. Essentially the audience focused not on the programming – as in the past – but on the reactions that the twelve viewers onstage had to the programming. Very powerful. Given that backdrop, our roundtable was eager to discuss the new marketing department. To put things into perspective, we had the BEST table in the room with the most diverse, creative and well spoken participants: a non-profit CFO, a soon-to-be-author, a branding expert and business school professor, a P&G visionary, a telecom CMO, a non-profit founder, an agency executive with online and social media expertise, a marketing PhD candidate, and a blogger. + Encouraging risk taking despite budgets and fear of failure [both institutional and individual]. Can compensation tied into new models help? + Developing a brand that is meaningful and relevant to customers, thereby justifying internal brand advocacy and disruptive product innovation [i.e., it's not about the company; it's about being relevant to the customer]. + Creating and managing a brand community. + Leveraging technology new to the industry and creating the means for evangelizing the brand. + Encourage collaboration amongst workers. + Must have an idea person. NOTE: I came across this article titled Ford Of Canada Lets Customers Stand For The Brand about letting Ford customers act as brand ambassadors. Whereas Univision, in changing the Upfront Event format, unleashed the Univision viewership passion onto the advertiser selling process, Ford Canada seems to be similarly unleashing the Ford customer passion internally via the "Powered By You" campaign. They have created a platform for conversation and then are stepping aside to let that Power take over. Also, visit the Brite '08 Blog. 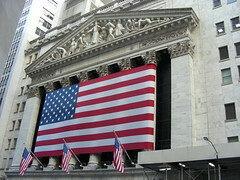 NYSE 2 originally uploaded by idowens. From Jubilation! Solutia Emerges From Bankruptcy, you know the good news. 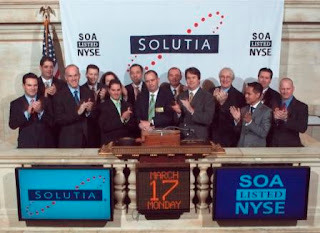 Which we officially celebrated today - Monday, March 17, 2008 at 9:30 a.m. Eastern time - as Solutia took part in the Opening Bell Ringing Ceremony at the New York Stock Exchange. Very cool to witness it via live NYSE webcast [you may experience it via recorded webcast] and to see our new stock symbol - SOA. In addition to the senior leadership of the organization, Solutia invited two employees to attend the ceremony. The two were chosen via random drawing. Essentially, all U.S. based employees were invited to participate. 1,709 employees expressed interest and of the two chosen, I know one: David Montgomery, Engineering Fellow, from our plant in Decatur, Alabama. The second, Jeff Leandro is Environmental Coordinator at our Indian Orchard site in Springfield, Massachusetts. What a great way to celebrate St. Patrick's Day! A while back, Drew McLellan listed links to posts that offered suggestions to new bloggers just starting out in New Blogger's Toolbox, including mine - Building A Blogger Toolbox. Perhaps because Spring is in the air [or the mind depending on where you are located], I've had lots of questions lately about blogging and getting started on the blogging path. Drew's Blogger Toolbox came to mind, as did some additional resource ideas. So, here are additional ideas for that Toolbox. I.e., Blogger Must Haves. My favorite reference manual is Buzz Marketing with Blogs For Dummies. I still refer to it and routinely recommend it [that came out of a MarketingProfs webinar in 2005]. For the more advanced new blogger, please don't forget to backup your posts. When I first got started, I used BlogCollector Lite. But, when Blogger updated to its current version, that option no longer worked. I confess: I didn't backup for an extended period of time. But, then, I cam across Communication Overtone's Kami Huyse's post about Cool Tools: Free Service to Back-up or Transfer Blog Content and I was hooked. Thank you, Kami! BlogBackupOnline is an easy-to-use web based backup service. Simply sign up for an account, register your blog and the updates will happen automatically - including comments and visuals. It's an amazing resource. And, it will be moving out of Beta in the next few weeks. BlogBackupOnline offers a free account means with 5 MB of storage, in addition to paid options [i.e., Professional at 50 MB and Enterprise at 1GB]. Although by mentioning BlogBackupOnline here, I hope to expand my free storage from 5MB to 10MB, I can't say enough about how delightful this resource is, and how easy to use it is. I hope never to have to require restoration, but if I do I have good feelings about what to anticipate. It's also just a matter of time before I become a Professional account holder. Another invaluable tool I came across via Google is Richard Rodger's Social Tag Generator For Your Blog Posts. This is a gem that has made tagging painless. Thank you, Richard. Do you have other Blogger Must Haves you'd like to add? I'd love to learn about them. In The Flooring Display Challenge - Part III: Design Centers, Floor Talk! 's Shannon Bilby explained the "level" system for displaying product choices in design centers, those very interesting hybrid retail places developed specifically for new home buyers. Here, we continue with perspective on how the layout and organization of the design center affected consumers. The layout of the Design Center helped with the success of the level system carpet display. The front doors of The Design Studio were an abstract design partly frosted, creating curiosity about what was inside. The doors were not open to the public and sessions were by appointment only. Once clients entered, they already felt like they were valued and in somewhere exclusive. Once inside, if the non selecting spouse (9 times out of 10 that person was the husband) was in attendance, he was immediately offered a big cushy leather chair, beverage of his choice, a variety of movies from The Blues Brothers to Pulp Fiction, magazines or a sign-up sheet to have a consultant from the grill store, billiard store or other fun businesses come to the next appointment to meet with him. Giving the spouse (husband) a chance to be comfortable while the decision maker (wife) was free to do work proved to be one of the best features of the whole design center. The spouse (husband) was not required to be at the selection meetings, but was often asked by the other spouse to attend. Most husbands had very little interest in the selection process. They just wanted to know how much she spent and be in a comfortable chair while she worked! After the first meeting, the spouse (husband) looked forward to having the option to meet with a professional to help him with an area of the home he was interested in at the next appointment. When the spouse (husband) knew he got brownie points for coming to the meeting - but did not have to actively participate in the selection process - there were virtually no selection changes made later in the process because he felt that he had contributed. Likewise, she didn’t feel like she had to make changes to the original plan because he was more likely to agree with the original selections since he had a say if he wanted to. Let me put it in slightly different terms. The home buying process is an extremely tense one with home buyers having to make so many critical decisions over a short period of time. Changes have financial implications so the more relaxed and focused the decision-makers can be, the better it is for the entire process. Design Centers must encourage buyers to relax. Ideally, one spouse can focus on the important decisions. The secondary spouse can be involved if he's interested, but otherwise she can efficiently complete the process without wearing either one out. Neither has reason to get into any tense situations that might escalate into a fight. Neither has any reason to decide at the last minute to opt for cheaper selections to pacify concerns about spending too much money. The less involved spouse can relax, too, or he can make his own upgrade decisions (e.g., grilling area), making the likelihood of his objecting to better oven upgrades and more expensive carpet almost non-existent! Every product was displayed in a furniture piece or custom designed piece of millwork - anything other than the typical carpet store displays found all across America. The Design Studio felt like a complete home with kitchen vignette, shower/bath vignette, lounging area and conference area complete with round table that encouraged exploration and decision making! During the process, no other clients came in to interrupt, no telephones rang, no distractions were allowed. This made the client feel important while giving them the ability to focus on their selections. Freshly made cappuccino and espresso started the meetings alongside a tour of the whole space to demonstrate everything that was available for selection. The whole feeling of the experience helped them realize the importance of why they were there. After this experience, how could they want to shop anywhere else? This environment that felt more like a home resulted in faster selections, fewer changes, happier clients, more loyal clients, more upgrades and more referrals. Most importantly, customers did not feel like they were being sold. It was an experience that got the designers onto more Christmas card lists than any other job they’d ever had! Thank you, Shannon, for this fascinating glimpse into a retail experience that goes a long way toward reinventing the presentation of flooring - and other home-related products. Amazing how creating an engaging, appealing, relaxing environment can be so successful in generating sales. 4x4 postcard originally uploaded by Erin Z*. Four bits of information per category. = 4 x 4 about me. Ann Handley tagged me. I wasn't quite sure what to make of it. Then, I started to get into the format. Check out Becky Carroll's [who also tagged me! ], Peter Kim's, Tish Grier's, Maria Palma's, Phil Gerbyshak's and Toby Bloomberg's. Don't you agree it's a fun one? + Mark Goren, Transmission Content + Creative, to whom I owe 8 more things! A special plea to all - especially those of you with connections to the beautiful state of California. It has to do with a beautiful - nearly complete - project called The California Rug Project, designed by artist Vicki Fraser, who has worked on it for 12 years. It tells the story of the State of California using native materials. Once finished, it will visit every County seat to tell the story of California. However, at 5 feet by 15 feet - with an 6 to 8 inch "hole" in the middle, the rug can be awkward to move around. Hence, the plea for help from Derek Hoyle - aka: Mister X & Delta 9 on KZYX - KZYZ, FM, Mendocino County Public Broadcasting who also regularly sits in on Roots Revelation & The Good News Guys on KMFB, FM. Derek - who in his spare time has taken up weaving - has accepted the task of searching for a rolling rack to hold the BEAUTIFUL and nearly completed California Rug. As it is now, the rug sits on a table and has to be moved several times a week, due to other groups using the room at the Mendocino Art Center. Currently, it has to be hand carried, unrolled, etc., and most of the wonderful women involved in this project really have to struggle, moving it around without some sort of holder/roller. Derek is looking for donation or long term loan of a small rolling rack, so the California Rug can easily be transported, moved and unrolled/rolled. First to finish trimming the rug, and eventually to display the rug throughout California in every County Seat. Does something come to mind? Might something already exist that fits the bill? It needs to look professional, too. He adds that this is a non-profit project, and any donations are tax deductible. Anyone inspired with a solution [or a donation] should contact The Mendocino Art Center and/or Derek Hoyle directly at helios [at] saber dot net. Day 1 of the Brite '08 Conference featured Pamela Kaufman, Chief Marketing Officer of Nickelodeon/MTVN Kids and Family Group, as she discussed "Building Brands in a New Media Environment." A six year old daughter means that I'm familiar with Nickelodeon. We're into Nick Jr. and Noggin. She loves the BackYardigans and Miss Spider Sunnypatch; Little Bill, The UpsideDown Show, WonderPets and Max and Ruby. She and her friends may not know that they are watching Noggin or Nick Jr., but they do know the channel number and how to access it on the remote [for us, it's 123]. As far as the 'older' stuff, I've caught some Nick at Nite and have come close to Slime Across America, although I made sure to steer far away from it [I just wasn't in a Be Slimed mood, ok? Even virtually.]. Until I heard Kaufman's presentation, I hadn't really appreciated how influenced my household is by Nickelodeon. As aware as I am of Disney [especially lately with High School Musicals and Hannah Montana] - and somewhat cautious of it [I can't help it, I'm suspicious of large, controlling, entertainment entities, even if I admire them] - I have really enjoyed the musicality of the BackYardigans and the cleverness of the Upside Down Show. From recent press releases, the boilerplate for Nickelodeon reads: "Nickelodeon, in its 28th year, is the number-one entertainment brand for kids. It has built a diverse, global business by putting kids first in everything it does. The company includes television programming and production in the United States and around the world, plus consumer products, online, recreation, books, magazines and feature films. Nickelodeon's U.S. television network is seen in more than 96 million households and has been the number-one-rated basic cable network for 13 consecutive years. Nickelodeon and all related titles, characters and logos are trademarks of Viacom Inc."
According to Kaufman, the Nickelodeon Network has been #1 for 13 years. She joined 11 years ago, becoming CMO in the past year when the rapid growth of the business led to the creation of the CMO position to effectively communicate one consistent brand message. [Here is info on her promotion to EVP in 2005.] In her opinion, the role of the CMO is changing, becoming more about strategy, development and execution to keep the brand message consistent across businesses and to the consumer. Nick's key challenger is Disney. Nickelodeon is expanding into the recreation business with theme parks [e.g., March 15: Mall of America Nickelodeon Theme Park], and a 20 year deal with Marriott [see Nickelodeon Resorts by Marriott] with family resorts scheduled to open by 2010 in San Diego, Dubai, Hawaii... Then, there's the family cruise this August 10-17 with Royal Caribbean. It has also developed in Kaufman's words a "Giant relationship" with Sony music promoting music and music based shows. Now a global brand, it is the most widely watched channel across world! Next, we learned about the ad sales/research market. Starting with research. In today's world, kids are consuming media across channels. The challenge, then, is how to break through the clutter and figure out how to reach them. But, Nickelodeon knows its audience! Through research - going to schools, observing, asking questions - it has learned how influential kids are in family decisions. In 2007, Nickelodeon obtained valuable insights on the environment, retail, the digital family [and how greater and easier access to content leads to more consumption of content]. Parents -more so than kids- consider cell phones an electronic leash, enabling them to keep track of and in contact with their kids. Kids use the Internet for school work; it's important! Nickelodeon has launched a new show called iCarly. [If you noticed the recent issue of AdAge featured an outer cover with iCarly with the words: "Ground Breaking. Breaking ground with TV & the Web, iCarly premiered as the first scripted series to incorporate user-generated content." Yes. It's scripted on air and uses user generated content; it's a true mashup of TV and the Web. Launched in September 2007, iCarly.com generated 60k submissions since its launch [i.e., in a 4 month period]. It's already the number two show after SpongeBob. [Read Nickelodeon makes its content "slippy" from Valeria Maltoni on MP Daily Fix re: iCarly]. Nickelodeon has also ventured into virtual worlds, introducing its new world Nicktropolis on 1/30/07. It's immersive with games, opportunities to connect, and personal space. It has 6.5 million regular users. Interestingly, Nickelodeon acquired Neopets in 2005. Kaufman says that the Neopets experience - a site where visitors average 51 minutes average per session - positively affected the launch of Nicktropolis. Where you aware of the following? In the advertising marketplace, Nickelodeon conducts 600 promotions per year. To ensure that advertisers connect with their audience, Nickelodeon creates custom content for advertisers. For example, 11 years ago, there were no automotive accounts. Today, there are 10! [Remember that family/kids influence decisions. ] For example, Chrysler launched the redesigned Town/Country minivan with Nickelodeon, promoting features -like the backseat TV- that would appeal to kids. In an ad created for Chrysler, Jimmy Neutron promotes the minivan. The promotion includes magazine, online, and on air components creating an integrated experiential brand message. Other example: Wal-Mart. Nickelodeon created Wally & Marty, new cool characters. Wal-Mart is heavily involved in the Kids Choice Awards, which celebrated its 20th anniversary in 2007. It's very popular, and the only awards program to be growing. Products sold in Wal-Mart feature a code that drives consumers to the website for voting. The company also works with Dreamworks Animation [Over The Hedge, Shrek movie launches], teaming up on global campaigns to break through the clutter. This can include time-locked music video [e.g., The Bee Movie]. The long and short of it is that: "What's good for kids is good for business. Kids are leading parents in entertainment." However, the trust factor is critical both with parents and with kids. Kids come first. Any characters and programs must be authentic and relevant to the Nick audience and brand. The Nick brand is open and inclusive [vs. Disney]. Nickelodeon characters represent the population; they are gender neutral, non-violent, fun. They connect with parents and kids [e.g., SpongeBob]. They help build an emotional connection with viewers. In an otherwise fragmented media environment, content and brand rule at Nickelodeon. For more about Kaufman, read Marketers looking to break rules should be ready to go ‘splat’. Second day at Kellogg School Marketing Conference brimming with unconventional wisdom by Ed Finkel. + Justin Fox's "Craig Newmark has a bright future in advertising, and Spotme is still cool"